In the language of Illanii, the "original tongue," Aurduin means "Sacred Land." 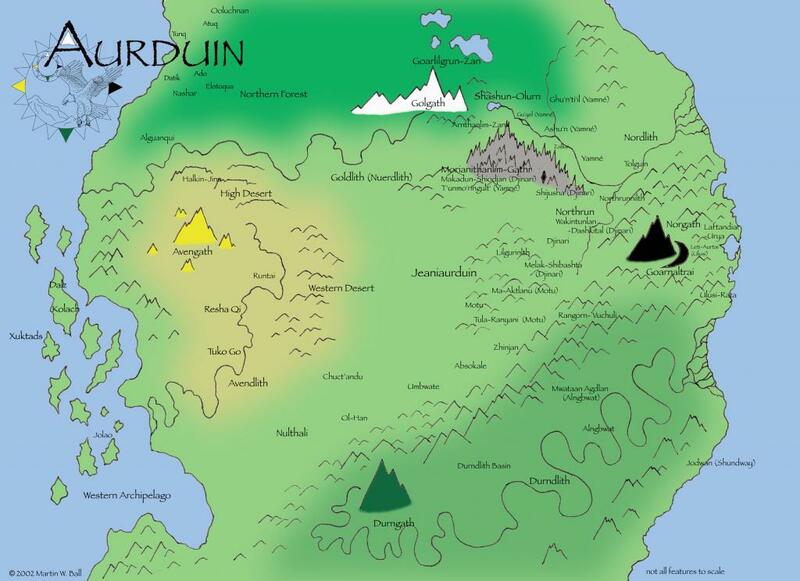 As can be seen from the map to the right, Aurduin is a continent that is home to numerous cultures. These cultures vary from hunter-gatherer nomads to highly sophisticated and technologically advanced societies and empires. Tales of Aurduin tells the story of an ultimate clash of cultures, religions, and technology that results in the dramatic transformation of Aurduin. Aurduin-Pedia is a handy guide to some of the people, cultures, and ideas that play a fundamental role in the stories. On the map, you will find place names (in various languages) as well as approximate locations of cultures. Explore and enjoy Aurduin-Pedia! Jolao - The "Righteous Hand" of the western archipelago, centered in the city of Dalz on Kolach. More a political and social conglomerate than ethnicity. Ooluchnan - Nomadic hunters of the northern tundra. Known for mastodon riding and herding. Khutan-Scyr - The "Dynamic Balance" of the Ulusi-Rata. A philosophical and mystical science of the energetic nature of being. Practiced as the Xhutai-Ku, or "Shaping of the Wind," especially by the sisterhood of Hyanchalth-Murira in Laftandiar-Urya. Understood to be "transcendental" in that these teachings and practices are shared by numerous ethnicities among the Ulusi-Rata. Practices also include teaching in animal empathy, mind-to-mind transference, entheogen mastery, language empowerment, meditation and mind-body exercises. Approximately 7,000 years old. Tal - The "Shining Path," originating among the ancient Nal-Hadrin of Kolach. The religion survived in mythical form among the Ulusi-Rata migrants and was reformulated to accommodate the arrival of Miraanni, taken by followers of the Tal as the fulfillment of the prophecy of the Wanlutan, the "Mother of the Perfect Creation." Original Tal was lead by the eight Zhu-Tal, the Guardian of the Shining Path, each of whom possessed a kyandara, a ceremonial knife made from the talons of a Great Eagle. Modern Tal only features one kyandara in the possession of Ashi, a Djinari women taken to be the Prophet or the "Holy Kyandara." Modern Tal centered primarily in Rangorn-Vuchuli after an exodous from Laftandiar-Urya. The Tal is thoroughly monotheistic and tends towards dogmatism. Original Tal was divided into the "Order of the Wanlutan" and the "Order of the Tal." Jolao - the "Righteous Hand" of the western archipelago. Lead by the Ringa, a group of alchemists understood to be the Living Gods of the west. The Ringa serve as spiritual, political, and military rules of the Jolao. Extensive mining operations are necessary to obtain kwatlon, also known as "tlon," the preferred offering to the Ringa, considered to be the food of the Living Gods. Each Ringa possesses a kyunduru, a symbol of divinity and personal immortality. Theologically, the Jolao stress ritual and cultural uniformity, purity, adherence to Ringa orthodoxy, and exclusive polytheism. A major ritual of the Jolao is the Rye Kyenu, the "Grand Lucidium," where the Ringa ritually kill a captured pagan slave before the public. The Ringa also receive offerings of tlon at this ceremony. 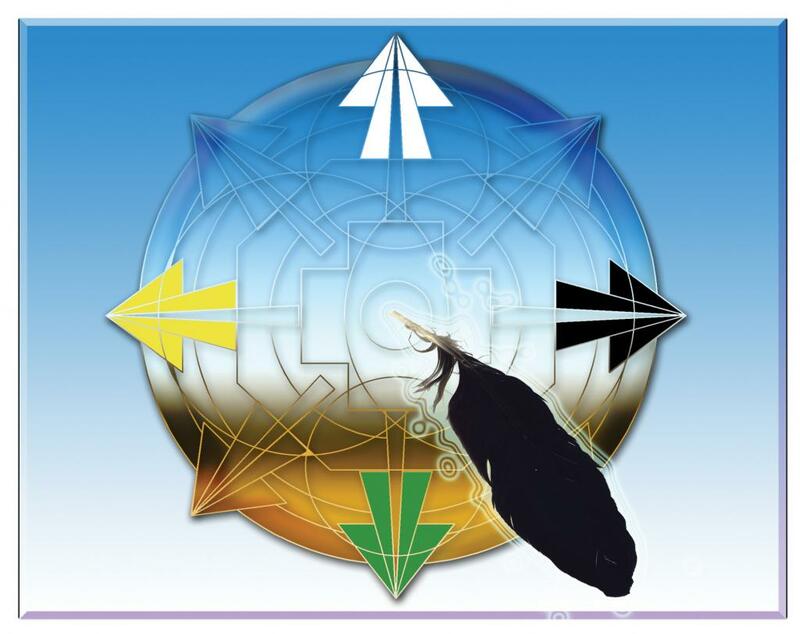 Altfein-Aryat - The "Teachings of the Gift-Givers," the original philosophy and science of creation as developed by the Illan. In primordial Aurduin, the Illan sang the features and beings of the world of Aurduin into being through the use of the Altfein, the sacred stones of creation. Their teachings and practices centered in the Orthirnen, the original Four Temples of Aurduin. In the Illan's passing into Karinduin, the Orthirnen transformed into the Orgathen, the Four Mountains of modern Aurduin. Though the Illan transcended, their teachings were preserved by the Arnyar, the Great Eagles, and the Illan's final creation, Orobai, the Preserver of the Four Ways. Mwataan - "The Serpent King" is a focus of both devotional worship and shamanic ritual among the cultures of the Durndlith basin. Not confined to any one ethnic group, virtually all cultures in the basin attend the Watwaan Ulagi at Mwataan Agdlan, the "Festival of Waters" at the Temple of the Serpent King. There, the Chaxta-Rhul guide the supplicants through a mass ritual, culminating with the consumption of the psychedelic sacrament, "The Elixir of the Mwataan." Ulmon-Tuh/Almon-Tah - The "Lord of the Sea," a system of worship and political rule in ancient Aurduin in the western archipelago. Survives in remnant form in Jolao society in the figures of the Zhuungdaon, the "shark wizards" who practice throwing sharks' teeth and are keepers of the dream pearl. Djinari - Shamanic/hunting spiritual tradition centered on the mountains, Makadun-Shiodjan, and the figure of Danmakadun, "Our Grandmother." Shuundway - Emergence story tells of a young girl who was led by the Shuunlar, the Moon-Moth, to the surface of the world. Uses shuunlar wings for divination. Yamne - Shamanic psilocybin mushroom-using tradition. A major ceremony is the annual "World Renewal Ceremony" where participants eat the sacred mushrooms and young adults are initiated. Nal-Hadrin - The origins of the Tal are found among the cultural traditions of the Nal-Hadrin, who occupied ancient Kolach. Focused on worship of the Great Eagles, which lived on Wujan mountain. Cult of Jao - Heretical movement within the Jolao Empire in resistance to the Ringa surrounding the figure of Rin Jao. Nashar - Bear shamanism and shape-shifting. Ul'mult'ah - Psilocybin mushrooms used ceremonially and for shamanizing among the Yamne. Known as "Bringers of Exalted Visions." Elixir of the Mwataan - A highly potent psychedelic extract made by the Chaxta-Rhul of Mwataan Agdlan. The ingredients are kept a closely guarded secret. Shuunlar wings - The wings of the moon-moth of the Durndlith basin contain a powerful psychoactive alkaloid that the moth synthesizes by feeding from the Jaspin bush and the Magwin tree. Wai-Ju - The "Dream Pearl" of the Zhuungdaon. Known for producing intense dreamlike visuals. Kwatlon/Tlon - Highly addictive mineral drug of the Ringa and considered to be the "food of the Gods." It is consumed by the Ringa in secretive rituals. Consumption of tlon by anyone not trained in the alchemical ways of the Ringa is fatal. Orobai - "The Preserver of the Four Ways" and final creation of the Illan. As keeper of the Altfein-Aryat, Orobai has many abilities, including shape-shifting, dislocating objects, projection of illusions, and is also semi-immortal in that he is reborn from the body of the earth approximately every 130 years. His age is estimated to be over 23,000 years. Unusual in appearance, Orobai is completely black. When shape-shifting, Orobai prefers the raven. Miraanni - Named "The Mysterious Child" by Orobai, Miraanni's ultimate identity was a question to even her. All white in appearance, she ages four times faster than normal. Considered to be a Divine Being and Savior to many. For the Tal, she is the Wanlutan, the "Mother of the Perfect Creation." For the Yamne, she is Sara'e, the "Heavenly One," the Yamne name for the morning star and the bird of prey, the kite. Rin Jao - Master Jao, the "Thumb" of the Jolao, the "Righteous Hand." Master Jao was the first of the Ringa to learn the secret of immortality from the Ancient Master and was instrumental in the formation of Jolao society and religion. Ashi - A young Djinari woman who served as a surrogate mother for Miraanni. Known to the Tal as the "Holy Kyandara" and Prophet of the Wanlutan. Kalzhat - The Zantuk of the Motu people and leader of the resistance movement to repel Jolao incursions into Jeaniaurduin. Nataali - Head Mother of the School of Advanced Mystical Arts, Hyanchalth-Murira, in Laftandiar-Urya. Ulanishar - Mother to Nataali, known as "The Matron" among the followers of the Tal in Rangorn-Vuchuli. T'lan - A Yamne Holy Man, friend of Orobai's, and mentor to Ashi who shares various methods of entheogenic shamanism with the budding prophet. We Jen - President of the United Industrial Alliance of the Jolao Empire. Responsible for overseeing technological and scientific development and adherence to Jolao technological orthodoxy. Rin Tuguan - Rival to Rin Jao and eventual leader of the Jolao empire. Jal Kwin - Yukainga priest of Resha Qi and head of the heterodox Cult of Jao in the desert provinces of the Jolao Empire. Ixshan - One of the primary Chaxta-Rhul of the Alngbwat, twin brother to Nataali. Kalisha - Personal assistant to Nataali and official chronicler of the Orobaian Age. The Orinen of the Illan - In the latter days of the Illan, they were divided into four distinct orders, each associated with a different temple in ancient Aurduin. The orders were named after the various four temples. Each order excelled and flourished with different aspects of the originally unified Altfein-Aryat. The Council of the Arnyar - In the days of the Illan, the Great Eagles, or Arnyar ("sky masters"), served as translators between the various orders of the Illan. When the Illan transcended Aurduin, the Arnyar becames protectors of the Altfein-Aryat and guardians of Orobai. Two of the Great Eagles live at each of the Four Mountains and regularly meet in council to discuss events in Aurduin and what actions must be taken to protect the Altfein-Aryat. Orrhutha - The four civil administrators of Laftandiar-Urya, responsible for government, commerce, education, and inter-cultural relations. Ringa - The Living Gods of the Jolao empire: Sixteen physical alchemists who made the ultimate transformation into an immortal state of being, characterized by tlon consumption. Extensive use of tlon has rendered the Ringa silvery-metallic in appearance. The Motu Resistance - Led by the Motu Zantuk, the resistance movement was originally comprised of Motu, Djinary, Tolguin, Absokale, and Zhinjan cultures. As the resistance effort grew, additional cultures committed themselves to the cause, eventually incorporating Halkin-Jinu, Runtai, Ooluchnan, Ulusi-Rata, Nashar, and other cultures affected by Jolao incursions and expansion. Wantne - The Holy People of the Yamne, divided into seven different Spirit Societies, each associated with a different figure from Yamne cultural mythology and oral tradition. Chaxta-Rhul - The sorcerer-priests of the Alngbwat at Mwataan Agdlan. Masters of entheogens and visionary plants, the Chaxta-Rhul perform ceremonies for the peoples of the Durndlith basin and make up the bulk of the Alngbwat men, virtually all of which are exiles from Laftandiar-Urya. Ku Fighters - Led by Ohada, younger sister to Ashi, "The Holy Kyandara," this is a group of highly-skilled martial arts fighters whose mission is to protect and spread the religion of the Tal and resist Jolao aggression. Laizhu - A group of seven Ku fighters of the highest caliber who are the personal security force of the Holy Kyandara. Zhu Tal - The eight Guardians of the Shining Path of the ancient Tal religion. Four men and four women, each possessed an original kyandara, an eagle-talon blade knife. Goargathen/Orgathen - The Four Mountains of Aurduin. Originally the Orthirnen of the Illan, four temples of four different colors. In the final transformation of Aurduin by the Illan, the Orthirnen were transformed into the various mountains which retained their original color. In order, the mountains are Norgath, the Black Mountain of the East, Durngath, the Green Mountain of the South, Avengath, the Yellow Mountain of the west, and Golgath, the White Mountain of the north. Homes to the Arnyar, the Great Eagles. Goarnaltrai - The "Great Void," both a philosophical concept of the Illan as well as a crescent-shaped lake of black water along the edge of Norgath. Jeaniaurduin - The "Heart of the World" in central Aurduin. A lush, mountainous area with numerous springs. Inhabited by the Motu. Mwatan Agdlan - The "Temple of the Serpent King" in the Durndlith basin. Primary center of worship and entheogenic ritual of the Serpent King. Dalz - Capital of the Jolao Empire on the island of Kolach. Shashun-Olurn - Lake in northern Aurduin and location of the annual Yamne World Renewal Ceremony. Nulthali - The vast grasslands of western Aurduin. Western Archipelago - Home of the Jolao Empire. Northern Forest - A vast forest of giant redwood trees that stretches across northern Aurduin just north of Goldlith, the White River, and Nordlith, the Black River. Home to the Yamne and Nashar. Laftandiar-Urya - The "City of the Rising Sun" in eastern Aurduin, located in a large bay surrounded by tall mountains. Central metropolis of the Ulusi-Rata. Tuko Go - Easternmost large city of the Jolao Empire in the interior of Aurduin. Used as a military gateway for incursions into the deep interior and Jeaniaurduin. Morianithanlim-Gathr - The Elk Horn Mountains, also known as "Our Grandmother's Bones" in Djinari and "Salmon's Teeth" in Yamne. Location of Arnthanlim-Zan, place of the Council of the Arnyar. Rangorn-Vuchuli - Abandoned ruins in a hidden valley in the mountains between the interior and the Durndlith basin. Used as a place of refuge by the Tal and known as the Sanctuary of the Kyandara.